Formulated for those with uncontrolled food intolerances. For preventing diet-related diarrhoea, nausea and vomiting (leptins). Eating can, and should be, a pleasure. But many people have at some point suffered from food allergies, whether to gluten, certain cereals, vegetables or dairy products… many too have experienced fatigue after a meal, or indigestion, gas, and bloating, or have gained weight without obviously overeating. ¤ Some common lectins, such as gliadin, present in wheat gluten (and also in other cereals), act to trigger the inflammatory cascade. Other lectins upset the balance of intestinal flora while those in potatoes and tomatoes may lead to arthritic pain. The majority of lectins stimulate harmful production of polyamines in the intestine and reduce the beneficial activity of natural killer cells. ¤ Lectins are found in almost all types of food and it is therefore impossible to avoid them completely. They are not easily destroyed or eliminated at high temperatures, and neither are they digestible. • N-acetylglucosamine (NAG) is the body’s most abundant mucopolysaccharide, particularly present in the digestive system and the joints. It is uniquely able to chelate the wheat lectins that cause intestinal hypersensitivity, thus protecting against the digestive stress they induce. • Extract of pectin from Citrus aurantium is an important source of fibre which increases the viscosity of the intestinal tract. In the large intestine and colon, microorganisms break down the pectin and release short-chain fatty acids with a beneficial, prebiotic effect on health. • Extract of algae Fucus vesiculosus is rich in fucose which binds to the yeasts and bacteria that cause digestive problems. • D-mannose is a beneficial sugar which binds to, and neutralises lectins from Escherichia coli preventing urinary discomfort. • The amino acid L-glutamine is the principal source of energy both for maintaining and repairing intestinal mucous cells. • Curcumin (in the form of phytosomes, as in our product Super Curcuma) specifically inhibits intestinal inflammation both in the short and long-term, due to its high bioavailability. • Arabinogalactans from Larix occidentalis are also an important source of fibre with a prebiotic effect. Their principal indication is protection of the colon from diverticulosis, IBS, Crohn’s disease and ulcerative colitis. • Sodium alginate is a fibrous gel which surrounds lectins after they have attached to sugars, in order to rapidly eliminate them from the body. It also prevents acid reflux and oesophageal burning. 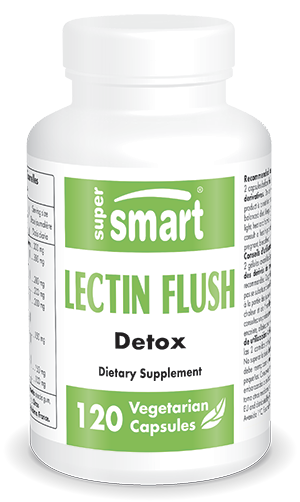 Lectin Flush is a first-line defence for anyone suffering from uncontrolled food intolerances and unexplained weight gain which, in many cases, it can help resolve. Other ingredients :Acacia gum, rice bran. Adults. Take four capsules a day : two before each of your two main meals.